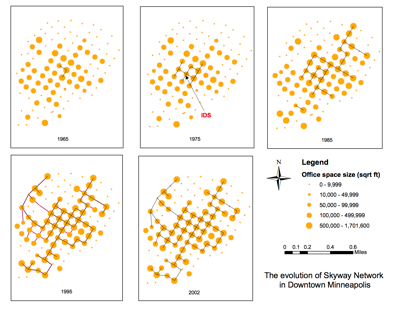 We study the structure and evolution of the downtown Minneapolis, Minnesota skyway network. Developed by private building-owners, the network evolved from tree-like to grid-like over the course of 50 years. We find that decentralized forces with the goal of maximizing individual buildings’ profitability shaped the network. Our analysis shows that a building with greater office size, a sign of greater accessibility, was more likely to be connected earlier. The distribution of existing skyway segments is found to follow a power-law function of the average degree, closeness, and eigenvector centralities of the vertices. We further explain and model the evolutionary process using an agent-based model. The simulation results suggest that the model replicates the network structure and its evolutionary process.